Will Dangote Refinery End Nigeria's Ongoing Oil Woes? 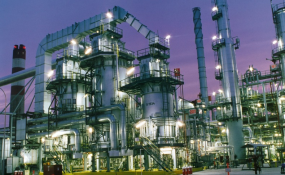 Will Dangote Refinery End Nigeria's Continuous Oil Woes? The $12 billion Dangote refinery will transform and diversify Nigeria's economy when completed in 2019. Speaking at the on-going Oil Trading and Logistics (OTL) conference in Lagos, yesterday, Mr. Devakumar Edwin, Executive Director, Dangote Group said that the 650,000 barrel per day refinery will stimulate economic development in Nigeria. Edwin, who was represented by the Director, Business Strategy and Optimisation, Dangote Refinery, Mr. Srinivas Rachakonda described the refinery as one of the most strategic socio-economic projects in Nigeria. He said that the refinery was designed to process a variety of light and medium grades of crude and produce extremely clean fuels that meet Euro V specification. The Dangote boss said that usually, the sulphur in petroleum fuels results in vehicle exhaust emissions that have negative impact on health and environment, adding that the Dangote plant has invested in most advanced technology to produce Euro V fuel due to help Nigeria meet the European Standard of gasoline. Rachakonda said that the project will provide thousands of direct and indirect jobs and add value to the Nigeria's economic development, noting that the refinery will lead to significant skills transfer and technology acquisition opportunities in the country. Also speaking, the former Executive Secretary, Petroleum Product Pricing Regulatory Agency (PPPRA), Mr. Reginald Stanley, said Dangote Refinery is going to be a game changer for the entire African downstream industry. Stanley said that the refinery would attract global attention and market when completed, adding that the initiative has raised hope for other African countries on the viability of investing in a huge refinery. He said the refinery would open a sub-regional market with a West African price index for countries in the sub-region, stating that when the refinery becomes operational, Nigeria's petroleum products import would stop or reduce drastically. Chairman, OTL Africa Downstream, Mr. Emeka Akabogu, said recent market tendencies have shown appetite for some categories of investment in the downstream value chain. Akabogu noted that there have been considerable investments in retail outlets development, marine logistics platforms and storage facilities across the country. Akabogu stated: "This year's event will further empower African oil and gas companies to harness the economic potential of the downstream sector in areas ranging from crude oil value addition to refining, to development of critical supply infrastructure across African States."